Most municipalities in the U.S. have adopted the International Residential Code (IRC) and the International Building Code (IBC, for commercial buildings). These documents specify the rules for railing design and use. Below, you can see a brief overview of these railing building codes. However, code interpretations vary across the country so it is imperative that you consult with your local code official before beginning any building project. Guardrails provide protection from falls. Generally, they are required on balconies, stairs, ramps, and landings that are above 30″ high. Top rail heights must be 36″ high (in most states) for residential and 42″ high for commercial. Handrails are a horizontal or sloping rail intended for grasping by the hand for guidance or support. Handrail heights should be between 34-36″ above the nose of the tread. Where guard rails are required on balconies, openings in the railings are restricted to an area no larger than what a 4″ sphere will pass. On stairs, the sphere size is slightly larger (see illustration below). 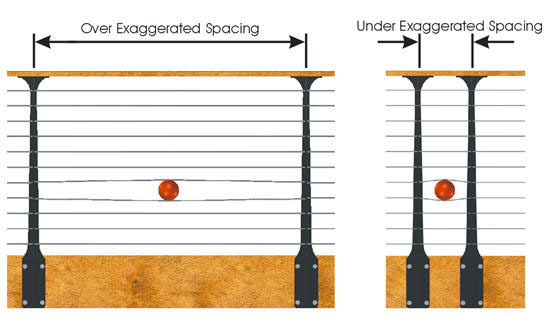 In the current IBC and IRC codes, the 4″ ball rule is not a test “under load” rule. The interpretation of this the dimensional test can vary so you should always consult with your local code official before starting your project. Note that the requirements differ for pitched versus level railings. Post-to-post spacing, post rigidity, and cable tension all work together in a system to prevent a 4″ sphere from passing through the cables. We space our cables 3″ apart and recommend a maximum post-to post-spacing of 42″. See illustration below.